Today there was an article in the Pittsburgh Post Gazette by China Millman – Consumers told to eat local meat – see article here. Over the past few days I have been reading about the record recall of 143 million pounds of beef produced by Westland/Hallmark Meat Co. YIKES! News reports are now saying there is little risk for us humans who may consume the beef. However, I am amazed and shocked at the cost of what we do in our culture to feed our unsustainable consumption – see article here. We would like to acknowledge our partners who help Tazza D’Oro stay connected to our food and coffee sources. We strongly believe in supporting local businesses and supporting businesses who produce, raise or grow the food/coffee that we serve you. We feel the connection to these sources are important to upholding quality and upholding the responsibility to each other. Even though coffee sources cannot be grown locally, we chose a roaster who practices sustainability and believes in developing strong relationships with growers and coffeehouses. 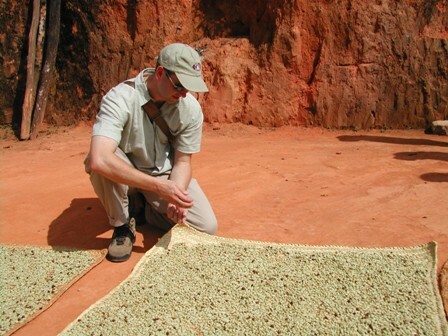 Pictured above is Scott Merle, Green Coffee Buyer and Roastmaster at Batdorf and Bronson – see sustainability practices. This particular picture is of Scott visiting the La Trinidad Farm in Mexico. Scott travels to as many coffee growing farms as possible; forging strong relationships with the growers and his company in order to produce remarkably high quality coffees while ensuring sustainable business practices. Our milk and cream are supplied by Turner Dairy. Turner Dairy uses only local farms and requires their farming partners to sign agreements stating their cows will NOT be treated with hormones and any cow being treated with an antibiotic will not be used as a milk source. BTW, they were named the 2007 as the “The Best Milk” in the US at the World Dairy Expo. Penn’s Corner Farm Alliance is another one of our partners. Penn’s Corner is an Coop of local farms who supplies Tazza D’Oro with locally raised beef, pork and poultry. Along with eggs, honey along with seasonal fruits and veggies. You can also join their CSA (community supported agriculture) to get local grown or raised food for your home. Then there’s my family’s bakery in Jeannette – Enrico’s Bakery. My brother Rob is a 3rd generation baker who makes all of the bread for Tazza D’Oro. Our bread is hand made and does not contain any preservatives or fillers. The pastries they make for us are baked by the same standards. Maybe someday Enrico’s Bakery will have a web site too!